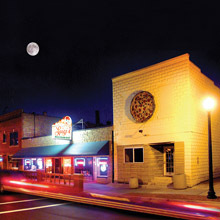 Every city has an Italian restaurant that is cherished by the locals. 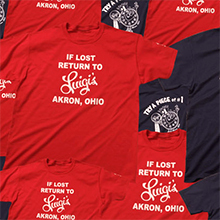 In Akron, that place is Luigi’s, opened in 1949 by Nick and Rose Ciriello. 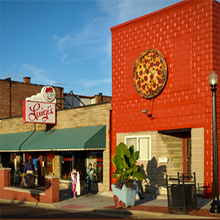 Today, Tony Ciriello, a third-generation Ciriello, and his uncle, Mickey Ciriello, oversee the 190-seat restaurant whose menu relies on homemade basics. 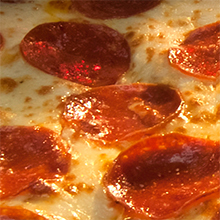 “We make all our own sauces and dough,” says Tony. 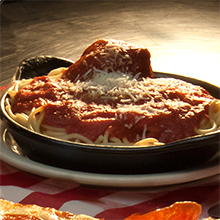 “We roll our own meatballs, mix and case our sausage, and make lasagna layer by layer daily.” Their secret starts with fresh ingredients and ends with constant care of family, which now includes the fifth generation. Mangia! CV tip: Valet parking is also available at the Marriott nearby. 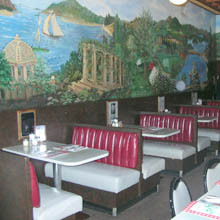 Luigi`s Italian specialties, including pizza, lasagna, antipasto, and spaghetti, are served among hand-painted murals of Italian landscapes. Nostalgic photos of old-time stars lend an atmosphere and appearance created back when it opened in 1949. 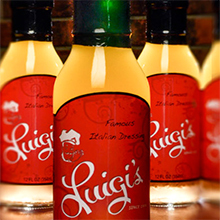 Their famous Italian dressing is available for purchase as well as t-shirts, hoodies and Luigi`s golf balls. 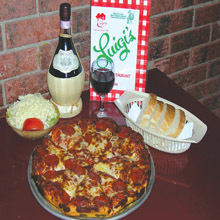 Carry out available. No credit cards accepted. Payment options: No credit cards accepted. Plenty of free parking. Also, valet parking available at the Marriott.